The way we do business – and the culture in which entrepreneurs operate – is moving forward at the speed of light. The days when a business owner regarded customers as simply a means to an end or a way to make a quick buck are over. Today, it’s all about customer relationships - sharing what you know and improve people’s lives. It’s about giving potential customers something they can really use: real-world solutions that help them out. While it would be ridiculous to give out all of your products or services for free, you can make free offers to potential customers on a regular basis. This will indeed prove beneficial to your business. You can bring prospects into the fold by simply asking them to fill out a form with their name and email address. This puts them into your subscriber database. As a way of saying “Thank You,” for signing up, you offer them value for free. I'm sure you've come across something similar to the opt-in box below some time or other. This is one example of how to offer your no-cost item. In this case, the surfer is asked to enter his contact details in exchange for daily 30 minute training for a week. - After a customer fills out a survey/questionnaire. Make it your normal practice to continually provide your website visitors with additional free useful resources. Don't stop at just one giveaway. This helps to initiate a relationship with your prospects and generate rapport. Hence, it makes it easier to turn these prospects into paying customers. Sidenote – Having a long subscriber list doesn’t mean much if you can’t convert those subscribers into buyers. It’s important to build a solid list of like-minded people. Your followers aren’t just a list of random names; they should be a targeted group of people with a common interest who are searching for similar answers. 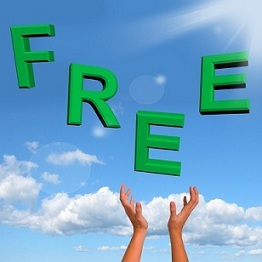 What Makes A Good Free Offer? It should serve as an introduction to you, your business, and what you offer to your customers. It should contain a quick, “how-to” method that your potential customer can follow on the spot. The content should be high quality, easy to read and follow, and provide real benefit to the follower. Free content can take a number of forms, from reports to e-books to videos or audio CDs. You can either create the content yourself in-house, or you can outsource the content to freelancers. Just make sure you choose your freelancers wisely, as there are many out there who charge very low rates in exchange for very low quality. A monthly webinar or training session can be a great way to disseminate some of your best information, and it can also help you establish rapport with potential customers. Here again, there are a number of possible formats. You can Skype with the potential client, make a phone call, or even set a face-to-face appointment. When you connect with a person visually as well as audibly, you’ll have much higher conversion rates. Sidenote - If you don’t have a finished product yet, or haven’t figured out what to give away, create a waiting list so that you can take advantage of it when you’re ready. A free offer has to be attractive. Being free is not enough. Focus on your topic. Zoom into your target market (who exactly you want to help) and concentrate on the need you’re trying to meet (what solution you provide). Connect With Your Prospect’s Emotions. Demonstrate to your target market that you know what they’re going through, and that you’re genuinely there to help meet their need. Your plan should be actionable. Point out any loopholes or obstacles and how to overcome them. Explain exactly what your prospect will get by following those steps. Where Should You Present Your 'Gratis' Item? It’s especially common for business owners to put up their no-cost offers on their website. Sometimes, this is not enticing. If someone sees the same free offer every time they hit your home page, they’ll get the idea that you’re either trying too hard to sell them something or that your free offer is without value. Deliver your offer in such a way that the customer must take action immediately to get hold of the goodie. Perhaps you’ll only offer 1-on-1 consultation to the first 15 applicants. Maybe the e-book you’re offering will only be available for 10 days. After the expiration of the 10 days or the submission of the 15 applications, shut the offer down for a while. One viable approach is to send your free offer via e-mail. E-mail allows you to make the offer in a conversational, personal way. As if it’s just the two of you talking. It helps give a human face to the offer and will help the recipient to open up. Give reasons for offering the item for free, such as starting the new year on a positive note, perhaps it's your business’s anniversary or a public holiday in your country. Make sure the e-mail guides the customer through the steps he/she needs to take to download/setup/delivery and how it will work for them. A great way to find out more about a client is via an online questionnaire or survey. You can use a website like SurveyMonkey.com. "What time of day/night does your little one usually cry inconsolably?" "What do you normally do to control the situation?" These questions help you 'filter’ your fans, so you only work with the ones who are most likely to follow you and purchase what you market. Valuable free ticket items serve to establish you as an authority in your niche. Plan and create well constructed giveaways that leave your prospects and existing customers with a ‘good feeling’ of trust in your business – as the go-to reliable source for providing solutions. When people like and trust you, they will buy from you. All this facilitates to deepen your relationship with your clients and help them turn into brand advocates.